Lenape High School senior Meghan Vizzard began making and distributing no-sew fleece blankets for cancer patients at age 12. Mayor Dennis Riley next to Lenape High School senior Meghan Vizzard. This week Mt. 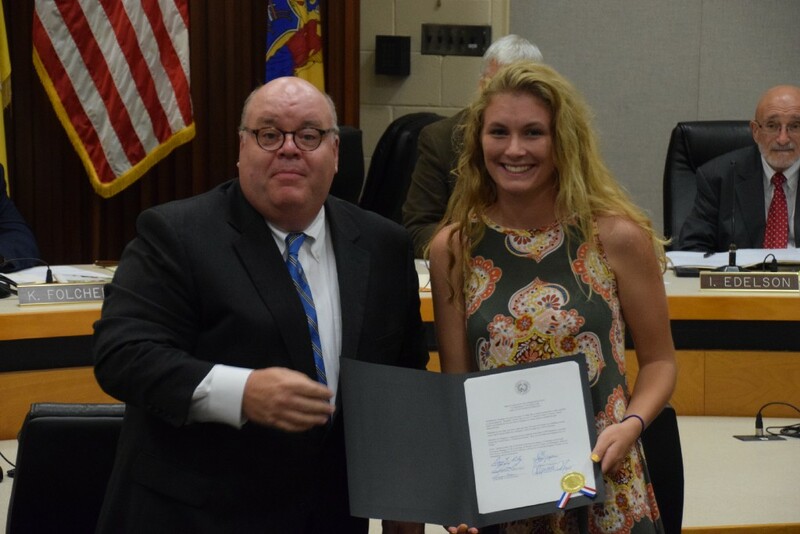 Laurel Township Council honored 17-year-old Lenape High School senior Meghan Vizzard for the “Cozies 4 Chemo” charity she began at age 12 to make and distribute no-sew fleece blankets to cancer patients going through chemotherapy. The idea for the charity stemmed from a blanket Vizzard made to give comfort to her then 19-year-old cousin who was battling ovarian cancer. The group became an official nonprofit in 2012, and since that time has donated more than 6,300 blankets to patients across the United States, Canada and abroad. All of the blankets provided by the charity are given away for free and shipped free of charge. According to a resolution read into the record at this week’s meeting by Mayor Dennis Riley, the township commended Vizzard for her “outstanding service and dedication” on behalf of all citizens. “We are so fortunate to have young citizens who go above and beyond and have a service such as this for cancer patients and to provide them comfort,” Riley said. To learn more about Cozies 4 Chemo or how to support the group, visit the organization’s website at www.cozies4chemo.org or visit the group’s Facebook page www.facebook.com/Cozies4Chemo. On Sunday, Oct 1, the group will also be holding its annual 5K Fun Run/ 1 Mile Walk at Laurel Acres park. The event is the group’s largest fundraiser of the year and allows the group to continue given blankets free of charge. The event will start at 8:50 a.m. with opening remarks. The 5K begins at 9 a.m. and the walk begins at 10 a.m.